Jared Diamond won a Pulitzer Prize and The Phi Beta Kappa Award in Science for this book, so I’m not exactly going out on a limb here in giving GGS a rave review; but it may be a stretch to explain why this is a must read for SF fans, and particularly for SF writers. Diamond may believe himself to be writing a sweeping analysis of human history based on the premise that geography is the single biggest explanatory factor, but he has in fact produced a comprehensive guide to world building. In Diamond’s case, the world being built is the present Earth, but it takes only the tinniest extrapolation to apply his insightful analysis to the back story of any SF universe one is writing, reviewing, or reading. Diamond set out to answer the question why Europeans ‘discovered’ New Guinea (or China, or the Americas, etc.) rather than the other way around. 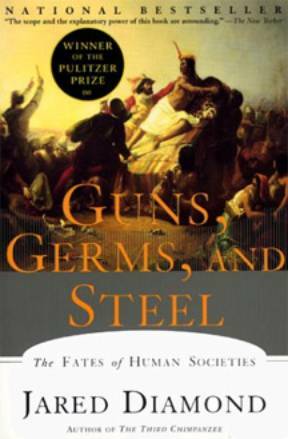 His basic premise is that the proximal causation of better guns, germs, organized government, literacy, etc. can ultimately be attributed to geography: some peoples had a head start (sometimes in the thousands of years) over others because they were lucky enough to live in areas where the switch to agriculture was feasible. Through meticulous and compelling argumentation, Diamond builds the case that Eurasia (including the Fertile Crescent) had access to more and better potential crops and animals suitable for domestication than elsewhere, and therefore developed agriculture first. Agricultural means higher population densities, which means more able bodied fighters with which to overrun one’s hunter-gather neighbours; higher rates of innovation that come from a settled lifestyle, specialists supported by agriculture surpluses, and a larger population base from which inventive genius can emerge; better arms and organization that comes out of better technologies; and nastier diseases, which evolve through close proximity to domestic animals (and to which those with long histories of herding grow immune while non-herders remain precariously susceptible). Much of what Diamond catalogs in his historical analysis will already be familiar to knowledgeable readers, but he ties everything together in a way that creates a ‘big picture’ of the influence of human geography that is reminiscent in its scope, pacing, and audacity of James Burke’s seminal Connection series. But beyond even the entertainment and educational value of GGS is its astonishing insights for world-building. Although not its original intent, GGS provides the scientific underpinnings for the geographic, economic — and thus historical, sociological, and political — back story writers require to produce thoughtful and credible SF. Reading Diamond’s book, I was constantly struck by how little I knew about crops basic to life elsewhere on this planet, or how fragile our current suite of foodstuffs really are. Yet too often, SF projects environments and experiences familiar to Westerners onto other planets or stellar empires without any appreciation for the diversity of environments on Earth, let alone ‘out there’. Where Diamond suggests that the ultimate fate of competing societies can be predicted simply by knowing the productivity (calories per acre per person/hour ) of their respective agricultural suites, SF writers blithely project interstellar empires where everyone is drinking Earl Grey tea or eating bantha burgers(hamburgers by any other name) as if none of this mattered. Books like Kingsbury’s grossly underappreciated masterpiece, Courtship Rite (Timescape, 1982), are the rare exceptions in depicting the cultural implications of the sort of environmental determinants to which Diamond makes reference. Furthermore, this book simply leaks great SF ideas, scenarios, and scenes. Not a chapter goes by without a hundred implications for possible SF. It is impossible to read Diamond’s account of the settlement of the pacific ocean island chains (from Polynesia to Madagascar), for example, without immediately seeing the parallel to interstellar exploration. Even his descriptions of the hunter-gather lifestyle, and the reasons some farming cultures chose to revert to it in preference to farming, beg to be turned into fantasy novels. But what makes GGS a must read for fans is that Diamond demonstrates that the proximal factors of the often one-sided encounters between cultures with different technologies — the guns, germs and spaceships that are the focus of much mass market SF — misses the point entirely, and that the outcome has usually been determined thousands of years before the encounter by factors that most SF authors have neither identified nor thought through as part of their back story. Reading Diamond’s compelling analysis of human geography/history would ensure that writers would never again overlook these factors, and that SF readers would demand better world-building than they have generally been getting. Originally Published in Neo-opsis # 8.